I’ve had more people ask me for this recipe than anything I’ve ever posted. This picture of the maple pecan bars went absolutely nuts on instagram. This is also my number one post! This made me a bit nervous because it’s not the typical super sweet pecan bar that resembles pecan bar, but now that I’ve made it several times, I can tell you, it’s addicting. 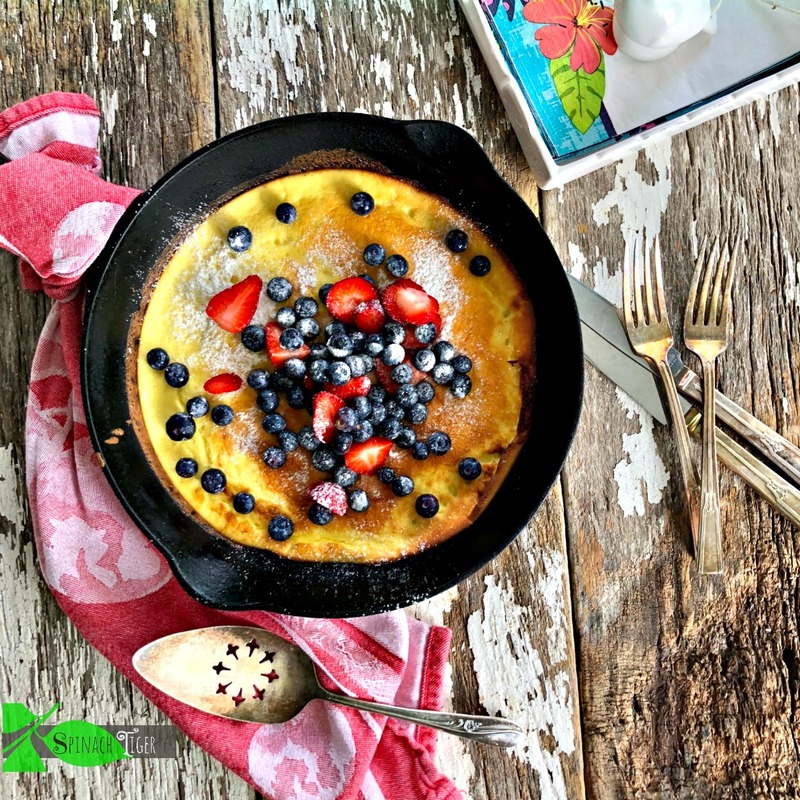 It’s decadent and yet it’s a keto sweet, low-carb, and paleo friendly. 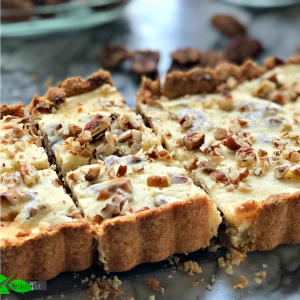 My inspiration comes from my favorite Christmas cookies, the Pecan Tassie, and I have a low-carb version. 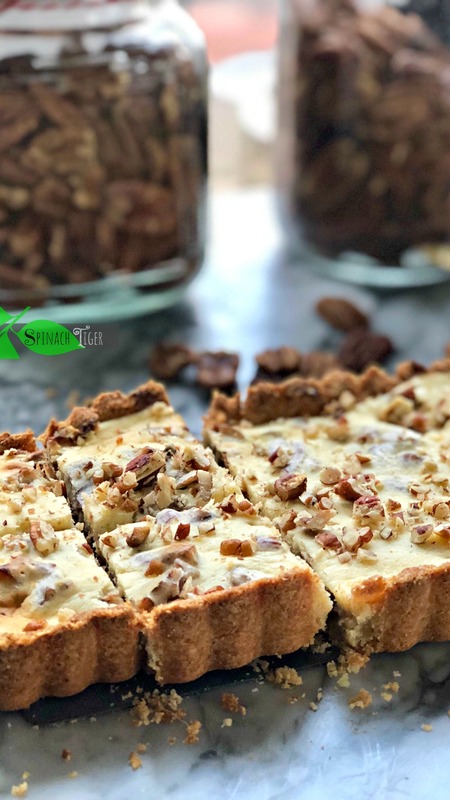 My love for pecans led to this very easy cookie bar that works for any low carb or keto diet and is diabetic friendly. 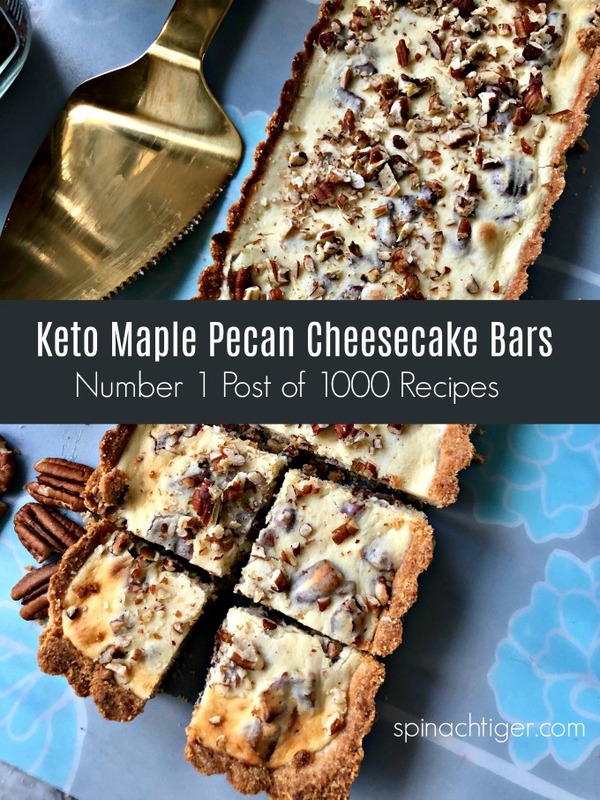 I had a friend taste test the first batch who is strictly following keto and she said the texture was perfect, and suggested adding in maple extract. My husband concurred that the maple extract woke this cookie bar up and has become a family favorite. This is not just for holidays, but is something you can easily make all year. I can have it all done in under an hour with ten minutes of active time. The only tricky part, although not difficult, is the almond flour crust. You can press it in with your hands, (instead of rolling it). In my video (that’s coming) I do roll it between two pieces of parchment paper. It doesn’t look like it’s going to work, but once you pre-bake it and you must pre-bake, it’s really good, not inferior in any way to other cookie bar bottoms. As far as the cream cheese part, it’s so simple. I use room temperature cream cheese, an egg, powdered erythritol (I use Swerve), vanilla and maple extract and you’re just about done. In my latest version, I added two tablespoons of sour cream. It’s not totally necessary but I like it. Chop one cup of pecans, bake for about twenty minutes and then chill thoroughly. Cut into squares and take to your next party! 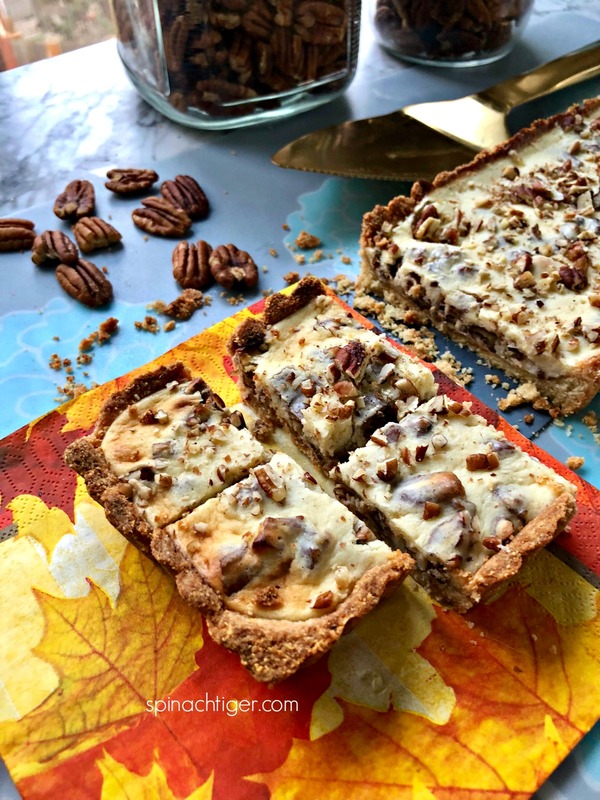 Maple pecan bars aren’t a cheesecake, but have a cream cheese filing that is inspired by cheesecake. After three tries, we flavored the cream cheese mixture with maple extract, and liked this version best. I had tried flavoring with various liquors and that just did not work! There are also options as to where to place the pecans. In the first version, I put them first before the cream cheese mixture. Either way, it’s good. It’s a matter of how you want it to look. If I put the pecans in first, I save a sprinkling for the top. 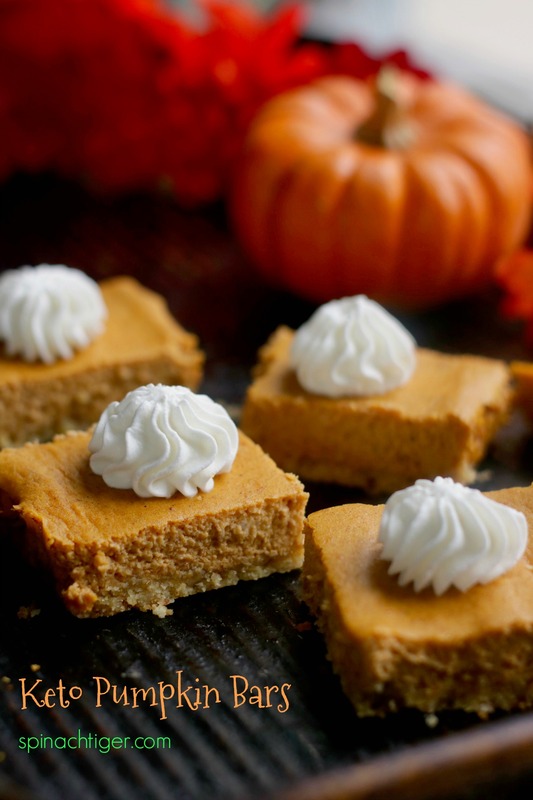 This year I made pumpkin cheesecake bars and didn’t do a side crust, only a bottom. I loved it. You can head over there for that recipe, where I crushed some pecans in the pie dough and I love it. I used this rectangular tart pan, for both recipes, but a square tart pan or square baking dish would work, if you plan on cutting them into squares. I’ve been eating low carb for over a year. 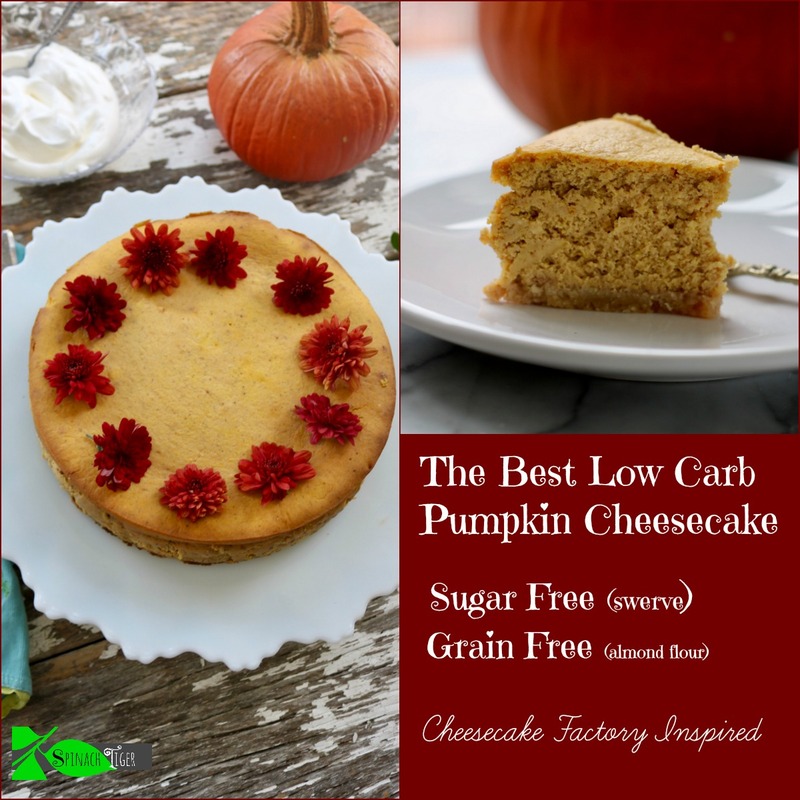 I am thrilled that the low-carb desserts that I can make are a part of the Spinach Tiger Big Fat Healthy Lifestyle. We have been able to lose a little weight and maintain it all of 2018 eating desserts like this every night. 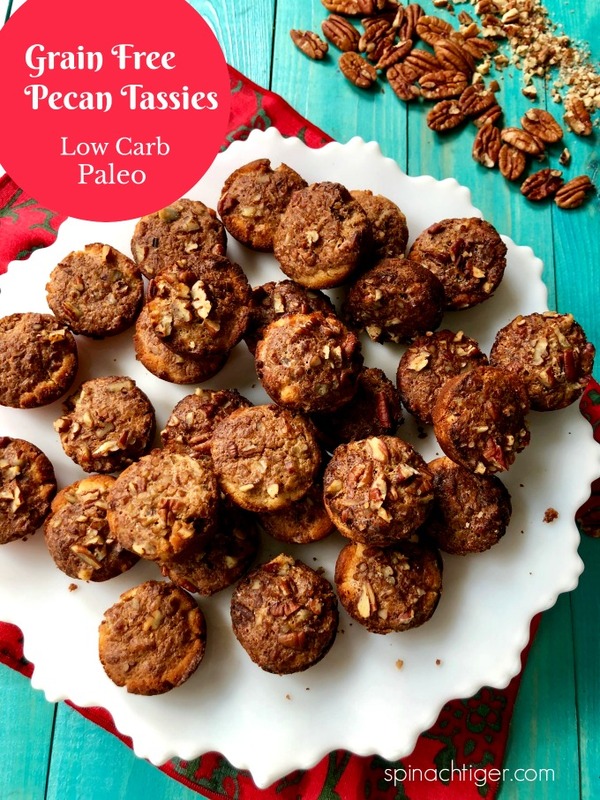 You will also love my new recipe for grain free pecan tassies. 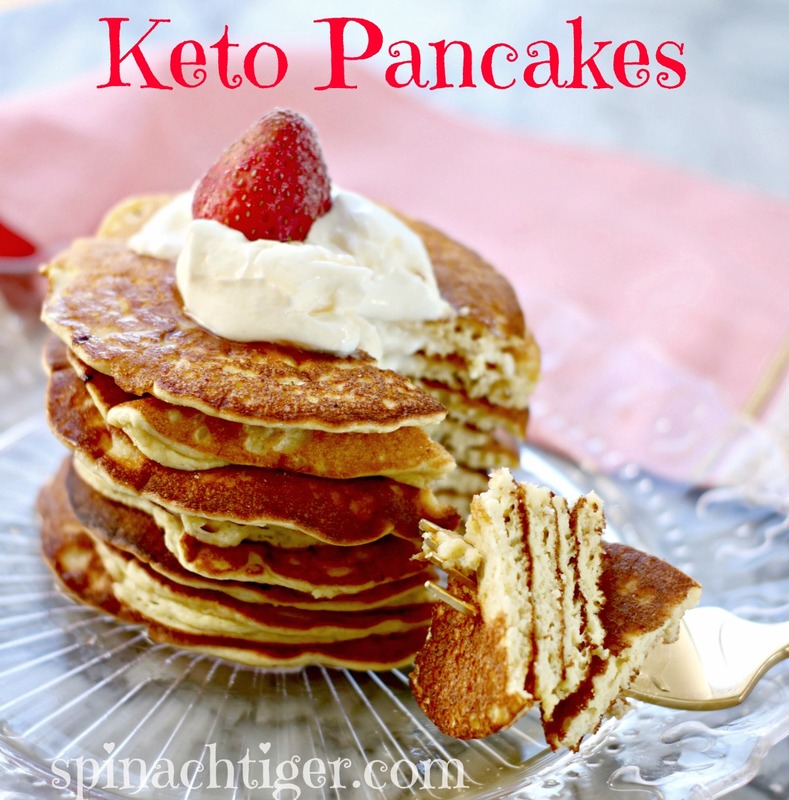 My three most popular low carb, keto friendly recipes are grain free biscuits, grain free tortillas, and these amazing fluffy keto pancakes. 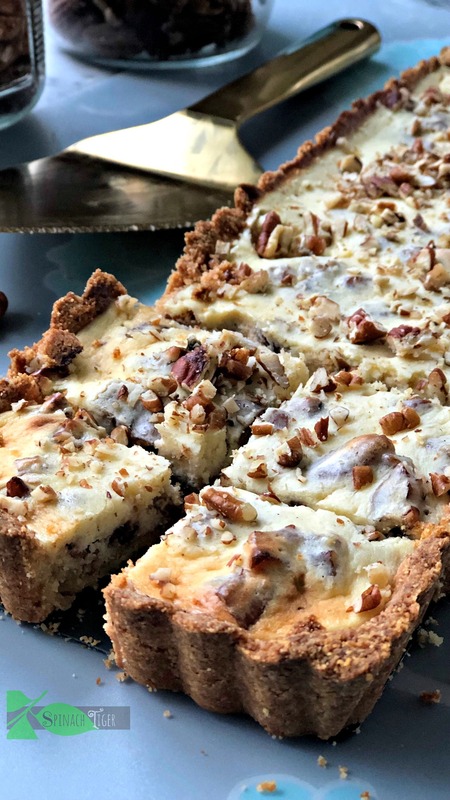 When pecans and maple come together for a cheesecake bar with an almond crust. This recipes contains Amazon affiliate inks, which earn a small commission. Melt butter and mix with almond flour, vanilla and swerve. Put in tart pan, by pressing in with fingers. Mix cream cheese with sour cream, vanilla, maple extract, egg. Start with ½ teaspoon extract and taste. Chop pecans .Mix with a little sea salt. Top with two tablespoons chopped pecans for garnish. To avoid the tart crust from burning, cover entire tart pan with tin foil. Use a pairing knife to cut out the middle tart part so that only the tart crust is covered. Bake for 20 minutes at 350 degrees F. or until cream cheese mixture is set. Refrigerate at least six hour, preferably overnight. Pan Used: I used this kind of tart pan, cutting into 16 bars. You can use any kind of square pan and just put the crust on the bottom as an option. Use parchment paper if you do that. Maple Extract: If you can't get real maple extract, you can skip this part. They are stll good without it. If using real cane sugar, you can substitute 1 to 1, but do taste filling to see if it's sweet enough. You might want to start with ⅓ cup sugar for filling and add more as needed. This Post contains affiliate links which earn a small commission, which helps to pay for the site. It does not raise any prices. These are heavenly. Added some almond extract to the crust because I love the smell. Had to freeze them to keep devouring them. Thank you! Jetta, I freeze things too to keep from eating them. THANK YOU. These are heavily. Added some almond extract to the crust because I love the smell. Had to freeze them to keep from devouring them. Thank you! Hi! I’d love to make this recipe but I’m allergic to any sweetener that is not real sugar. Yes, all of them. I’m hoping you’d be able to help me out with a conversion to either regular sugar, confectioners sugar or brown sugar that I could use in place of the Swerve. Any help would be greatly appreciated! You can use regular sugar one to one, but in the filling start with 1/3 cup and add as you desire. What can I replace for erythritol? 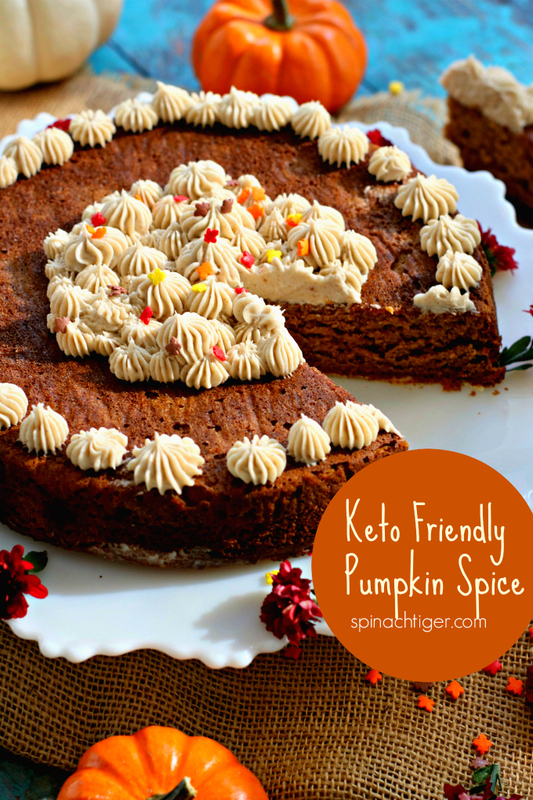 Can I use coconut palm sugar for a keto friendly recipe? What’s the replacement quantity for your recipe as is? Is maple syrup and maple extract same or different ? Can you use interchangeably ? You can use any sweetener that doesn’t have carbs in it such as stevia, or I prefer stevia glycerite. I would recommend you tasting the cream cheese mixture. If it tastes sweet enough to you then great. Coconut palm sugar I believe has carbs. Maple syrup and extract are not the same thing, not in any way. Maple extract is an extract like vanilla extract. You cannot use them interchangeably. 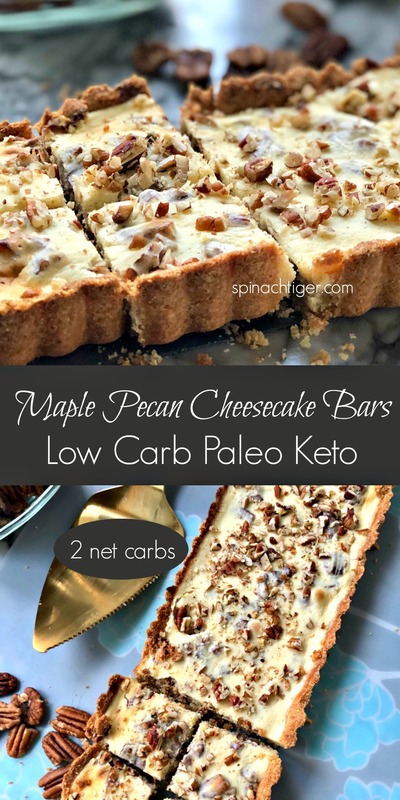 If you do add maple syrup to the recipe, it’s not going to be low carb. Thanks for your reply.. I tried the tart just now.. within 10 mins of adding the sour cream the cream cheese curdled!! I baked it anyway because I couldn’t salvage it. It has a curdled texture after baking as well.. yet to taste, but it was real easy to make otherwise..
That should not have happened. Sour cream is a very common addition to cheesecake. Cream cheese is very hard to get to room temperature. Next time perhaps microwave the cream cheese for about 10 seconds and get sour cream to room temp. I added it cold last week when making a video and it was fine. You can also skip the sour cream. Another idea is to mix the sour cream with the egg and then add to cream cheese mixture. I’m sorry that happened. My cream cheese mixture ended up looking like cottage cheese after I mixed it. I did leave the cream cheese out so that it was slightly softened, but the egg was right out of the fridge and I’m sure cooled down the cream cheese enough where it wouldn’t mix. It’s in the oven now and will probably be fine, but when I make it again I will definitely allow both the egg and the cream cheese to come to room temperature. Yes. When my cream cheese is cold and I forget to take it out. I put it in microwave a few seconds. I will run cold eggs under water. I will have to admit I flubbed this one – by accident. I overlooked putting an egg in the filling. I did mix in about a cup of heavy cream to thin the cream cheese. When I discovered my mistake, I thought about going ahead and adding the egg, but decided to leave it a chilled dessert instead. I tried to spread the mixture over the nuts and that didn’t work, so I mixed the nuts into the cream cheese. And finally, I didn’t have maple flavoring so I used rum flavoring. So, even though I took significant liberties, it’s still a keeper and I will try to follow the directions more carefully the next time! That’s funny sort of. You know sometimes if you just keep going, you can salvage a recipe. I am going to remake this a few more times to be absolutely certain to the tiniest degree this recipe works, even though last Fall I made it about 6 times. I say that because its my number one dessert on Spinach Tiger out of HUNDREDS. I do have a new one coming that’s similar, made with heavy cream and nuts and much easier. Stay tuned. I added it in. It’s really an option. I used about 1/2 teaspoon. I would love to try all of these recipes.It’s hard to decide which one to make first,they all sound good. What is the nutrition content? did you ever figure out the nutrients? We want the nutrient info pleasee. Idek how there is no nutrition info on here but here’s what I got with the cupcakes I made from this recipe. For 12 servings: 269 calories, 24.9g fat, 50.8mg cholesterol, 80mg sodium, 5.3 total carb, 2g fiber (3.3 NET CARBS), 6g protein. As far as a review.. these were fine, they weren’t my favorite but they were relatively easy to make, though next time I might cut the crust down so there’s not as much. You could cut down the crust by making bars with no sides I’m thinking that’s a good idea. A few notes: in the instructions for both the filling and the crust it says to add vanilla, but in the ingredients list there is no mention of vanilla at all. Is it real vanilla, or pure extract and how much? In the directions for the filling, it does not say to add the swerve in. I am assuming that I will add it in with everything else and mix, but if it is added in different, please let me know. Does it have to be confectioners? I have Splenda that I use for most of my low carb desserts. Would this be a good substitute? 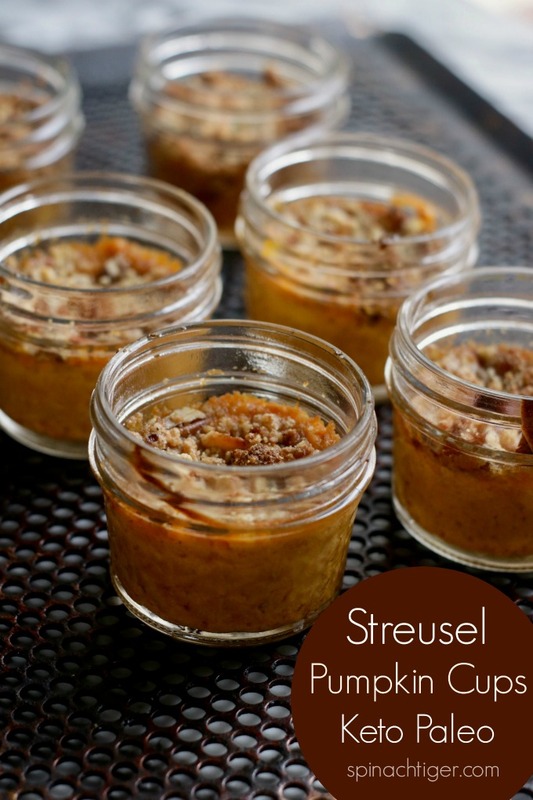 I took a guess on vanilla, and am getting ready to make these today. I will comment on how they turn out with my estimates. I was wondering if you made these bars, and if so, did you substitute Splenda for Swerve and did you use vanilla in the crust and filling or just the maple extract in the filling? The recipe is very unclear, and I was hoping you could tell me how they came out. These are AMAZING and so easy to make! We’ve made them twice, and they come out perfect every time! Had these three times now. Easy to bake. So satisfying. Texture is wonderful. So how much if any vanilla did you use for the crust and the mix? What temperature do you bake the crust and bars? to get it before the holiday. Can i use maple syrup instead of the sugar?